indulge | Ready, Set, Glow! Treat yourself to a bath ritual ! I’m back! So happy to be back blogging and to be out and about doing what I love, sharing my passion of green beauty. I have so much to talk about in the coming weeks (e.g. overdue reviews), but I respectfully ask for your patience. Please, bear with me. Thank you! Fun fact: In Sanskrit, Malaya means a “garland of flowers”. How beautiful! Armed with an impressive background on herbalism, natural perfumery, product formulation, aromatherapy and research, natural beauty and founder of Malaya Organics, Katya Slepak created a facial and body line of products with the purest ingredients to nourish and to restore the skin. I really can’t get enough of Organic Bath Salts in Lavender and Vanilla Absolute*. WARNING: it’s addictive! 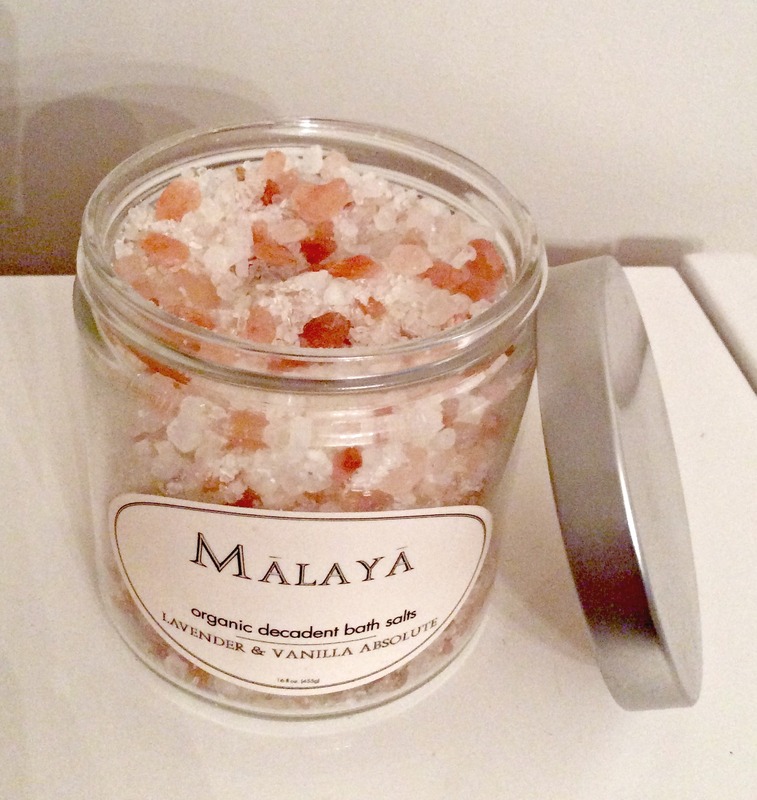 For me, everything has now become an excuse to take a bath using Malaya Organics‘ Bath Salts. Truth be told, I was originally afraid of bath salts because I thought they would dry out my crocodile skin. Not the case with these natural goodies!! Bath salts are usually beneficial to detox and aid in the remineralization of the body. This was the first time I’d use bath salts… (I know, I know…I’ve been missing out!). As I pour the salts into the running water, I’m captivated by the blend of floral and sweet notes of lavender and vanilla. Party for my senses!! Within minutes soaking, I’m relaxed and I can feel my body releasing tension and giving into comfort and ease. All of a sudden, time stops and nothing else matters. 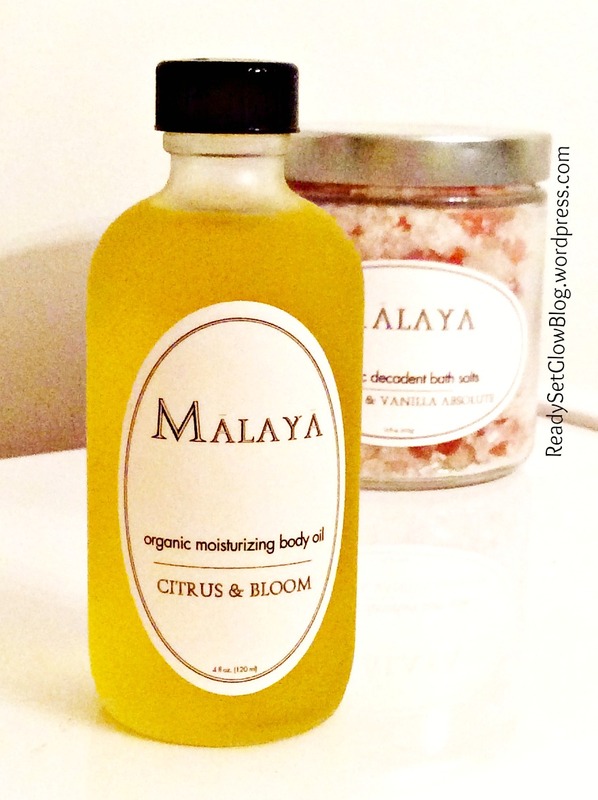 This bath ritual is not complete without the delectable Citrus & Bloom Organic Moisturizing Body Oil* . I’m dreading the day where I’ll be out of this oil! 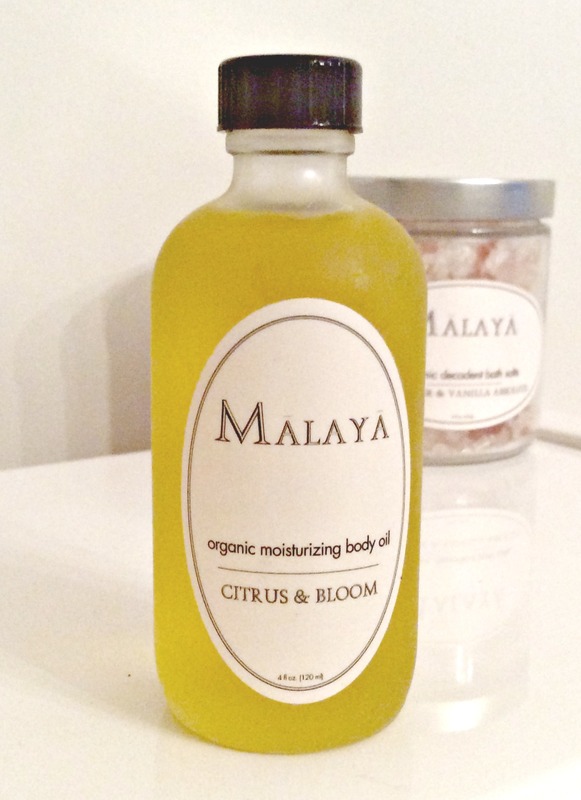 I use it after a bath or shower, but also in lieu of perfume: it moisturizes my skin and leaves a fresh fragrance. The scent of this body oil is subtle but still very alluring; the sweet citrus notes enliven my spirits as notes of Jasmine and of Neroli bring a soft feminine floral touch. My skin is left moisturized, revitalized and soft. I’m feeling peaceful and centered, and I smell sooo good! Aaahh! Ready to hit the sheets! Jojoba Oil*, Sweet Almond Oil*, Sunflower Oil*, Safflower Oil*, Argan Oil*, Avocado Oil*, Rosehips Oil*, Herbal extracts – [Arnica Flower*, Plantain Leaf*, Calendula Flower*, Chamomile Flower*, Yarrow Leaf and Flower*, Lavender Flower*, Elder Flower*], Proprietary blend of Essential Oils and Absolutes *^ including – Bulgarian Rose Absolute*, Neroli Oil*, Jasmine Absolute*, Grapefruit Oil*, Vitamin E Tocopherols (GMO Free). I consider this product my special treat after a grueling hospital treatment. When I get home, I’m so exhausted, I’m in pain, I’m anxious and a little down, but this is the perfect antidote! 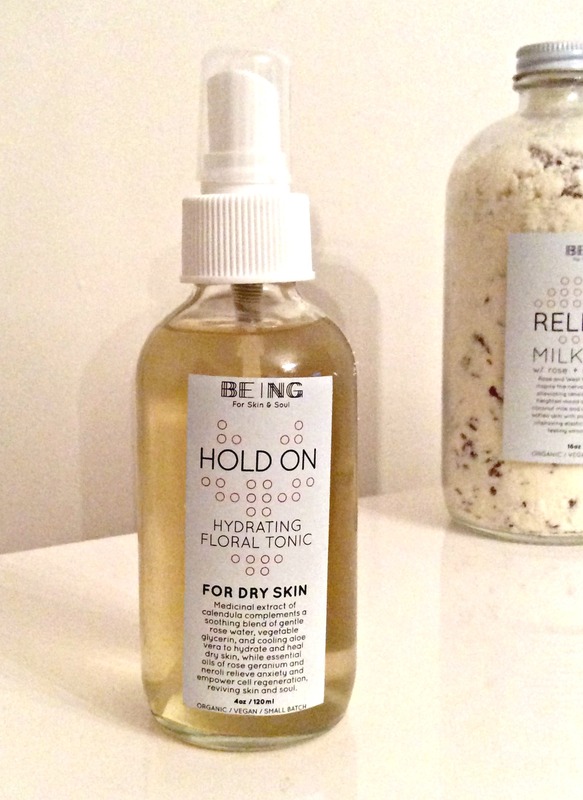 BEING is a minimalistic 100% natural, socially responsible brand whose creator, Cynthia Cortina, believes in “BEING” in the moment by creating self-care rituals that give us a sense of purpose and depth in life. Bath ritual: As part of my ritual, I do dry brushing before taking a bath to help shed impurities; then, I quickly rinse in a shower before heading in the bath. Remember the television ad: “Milk, it does a body good!” Turns out, it wasn’t so far fetch, except, it had nothing to do with our bones! Historically, milk baths have been used by the most notorious queens, such as Cleopatra (who used fermented sour milk, yikes!) and Elizabeth I of England. Milk baths can improve skin’s appearance. The lactic acid in the milk removes dead skin cells and encourages skin cell renewal. The cocoa butter and coconut milk in Release Milk Bath will soften and moisturize your skin. This aromatic bath product also helps me release any tension thanks to the Sandalwood essential oil. I probably use more than I should, but I really can’t resist the “creaminess” of the water and how it glides on my skin. The subtle scent of coconut takes me back to my teenage years when my grandmother used to make us creamy coconut pudding. My favorite part is seeing the rosebuds here and there laying in the water. There’s a certain sensual and sexual appeal to a milk bath with rose petals caressing your skin! Roses have a way of making a woman feel like a woman! It works for me! After a couple of minutes drenched in this milky concoction, I’m feeling like myself again! I could soak all night long… Alas, when I do manage to get out of the bath, I generously mist Hold On Floral Tonic*. Technically, it’s a face mist, but I mist all over, whenever! 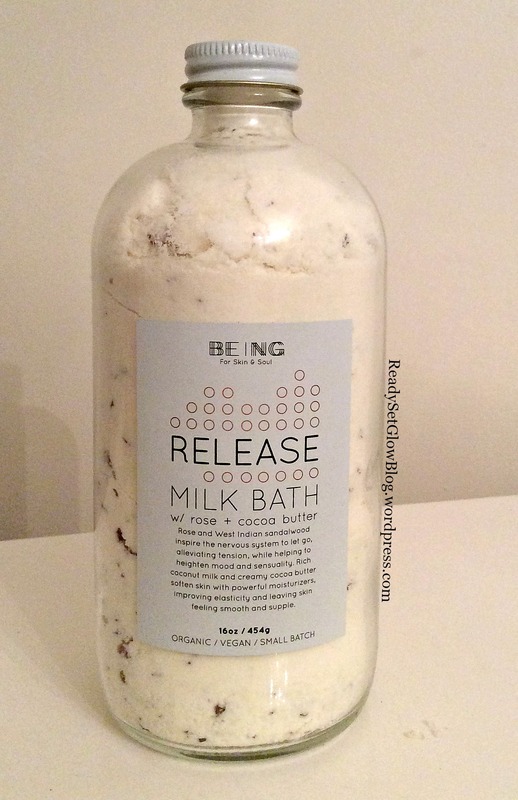 The main ingredient is rose water, so it makes for a great companion to the Release Milk Bath. I finish with a body oil or body butter. Bath rituals are now treasured moments of self-care where time stops. We live in such a fast-paced society; I don’t to wake up one day wondering where the heck has time gone by. YOLO, people, YOLO (e.g. You Only Live Once!)!! Don’t wait for New Year’s to make that resolution, start today! We owe it to ourselves to pamper and nurture our skin, body and mind. Give yourself permission, go on… Treat yourself!